Even more tourists will be heading down Lombard Street today. The world's crookedest street has taken a new twist. San Francisco's Lombard is now a life sized Milton Bradley board game classic. The iconic landmark has been adorned in sugary decor and colors to honor the 60th anniversary Candyland, in what event organizers are touting as the world's largest game of of the family favorite. Lombard Street on Russian Hill, featuring a quarter-mile of hairpin switchbacks, was remade this morning to resemble a larger-than-life version of the game, which was introduced in 1949. Event organizers were up before the crack of dawn to sugar coat the street with over 3,000 purple, yellow, blue, orange, green and red foam pads. The children will compete in teams in races down the windy stretch. Some of the neighborhood children have also been invited to participate. Eleanor Abbott created the game in 1949 as a diversion for children recovering from polio, a disease she once had as well. 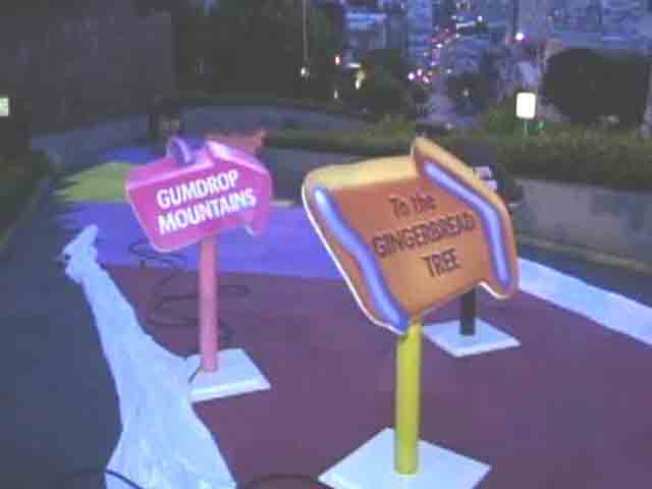 Candyland was supposed to be a magical escape full of sweets and chocolates to keep the kids' minds off of their own suffering.